What a great trip discovering an older way of life. Part of the fun will be traveling in our comfortable small bus and stopping when we want for photographic opportunities. The overall plan is to begin in Cluj-Napoca and head to the Maramures to explore the region's bucolic villages. Moving back into Transylvania, we visit a Roma family to explore gypsy culture and stay in Viscri to photograph the craftsmen, bakers, brickmakers and other workers. The medieval architecture and fortified churches bring character to the Romanian landscapes and the tour of the majestic Bran Castle is on everyone's list. Working our way back to Bucharest, we leave Romania after 10 days of discovering the hidden corners of this intriguing country. ​ Our final schedule could be altered due to weather, transportation difficulties or other reasons beyond our control. If you are registered for the workshop, we will notify you when we have reached the minimum number of participants so you can make your flight arrangements. Join us for this not-your-usual photo workshop! Arrive at the airport and be picked up outside the baggage claim area. You will be taken to your hotel in the heart of the city. Evening introductions and meeting with your fellow travelers in Romania. 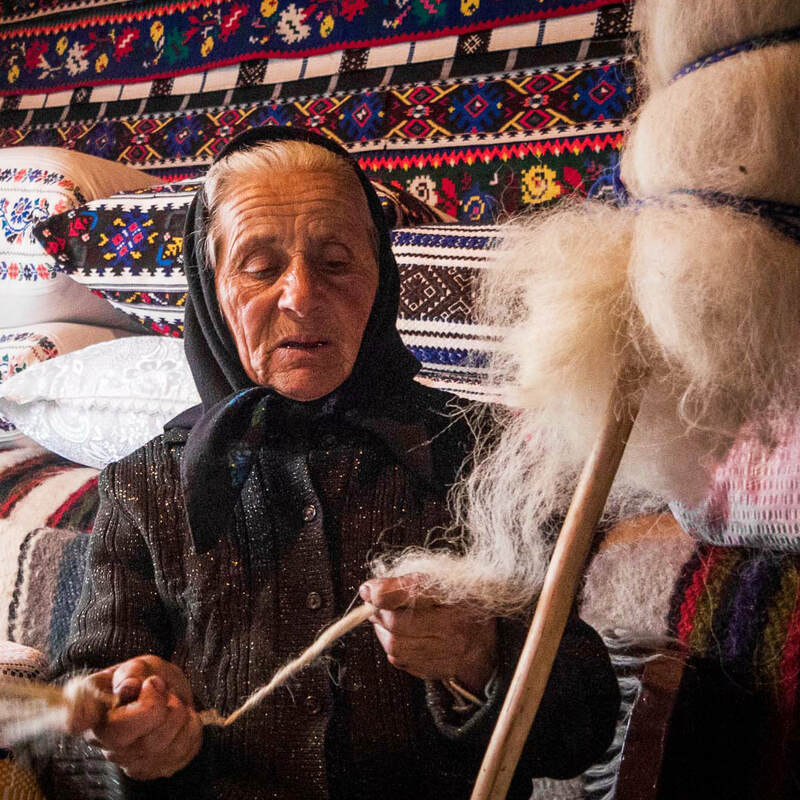 We start by traveling to Maramures, the most authentic region of Romania where there will be plenty of opportunities to photograph the daily life of people, beautiful landscapes and local traditions. There will be lots of opportunities to stop and photograph the landscapes dotted with haystacks or people working in the fields. En route, we visit the tallest of the famous wooden churches unique to the Maramures. This UNESCO World heritage site is located in the village of Surdesti. At another stop, we will meet a talented potter and photograph him at work in his workshop. He still uses authentic methods from 2000 years ago, crafting the objects from clay and decorating with traditional designs. The last stop is the Merry Cemetery of Sapanta, with its crosses decorated in lively colors and featuring funny poems about the lives of the deceased. We will visit the workshop of the woodcarver who makes the crosses and hear more about this fascinating tradition. Check in for a three-night stay at a family-run, rural guesthouse in Vadu Izei. Sunday morning will bring locals dressed in their Sunday-best, coming to church in family groups of all types from families with all children to the elders of the village. Once a year, the villagers have an event that celebrates the first villager to go out and work the fields that spring. The event is charged with symbols related to fertility to encourage a successful agricultural year. We will be there for the event and have some unique photographic opportunities. People will be dressed in traditional clothes and enjoying the special music of the region. After the event, we travel to Sighet, a nearby town known for its large Jewish community that lived there in past centuries and the location of one of the largest communist prisons. We will visit the prison, now an interesting museum, and learn about the communist times and how they impacted the culture of Romania. The early morning light will be perfect to photograph the beautiful wooden monastic complex in Barsana followed by a visit to a woodcarver's workshop to learn more about the elaborate wooden carvings on the houses and gates of the Maramures. 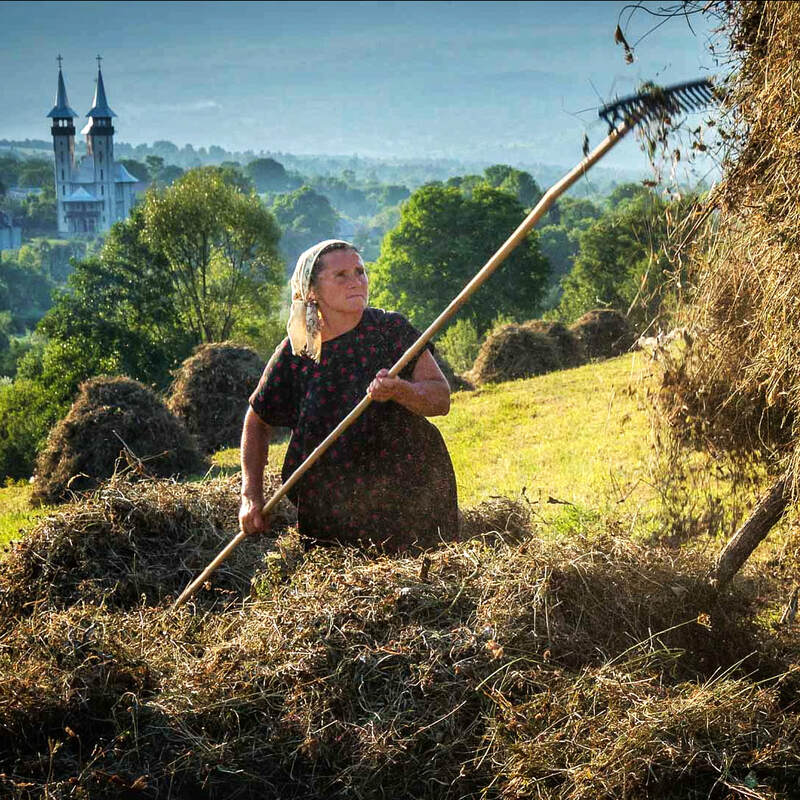 The day will bring opportunities to photograph the Maramures families at work, often using old farming equipment such as threshers, grinding corn using a water wheel and distilling the local fruit brandy called horinca. Another visit takes us to the hatmaker who creates the traditional hats of the region. After lunch and a break, take time to wander through the charming village seeing people working in the fields, completing household chores and passing by on horse-drawn carts. ​Leave behind the Maramures and head back to Transylvania, a place known for its rich cultural heritage and beautiful architecture. The drive will be dotted with photo opportunities and sightseeing along the road and a great time to do some photo editing on the bus. Stop at the star-shaped fortress in Alba-Julia, a historically significant location of the 1918 gathering of the three main regions of the country uniting to form Romania. This is the largest fortress in the country. Along the way, the Turda Salt Mine offers the other-worldly experience of descending into the ground to find a giant open space with salt walls and a small lake, Ferris wheel, amphitheater and mini golf course. Some claim that the salt cleansed air brings a level of health. Can't miss that! From the bizarre back to the medieval, end the day in charming Sibiu, elected European Capital of Culture in 2007. Begin with an optional sunrise shoot in the surrounding mountains or catch up on a little extra sleep. Late morning visit a glass factory where we can photograph the entire process of making glass from its raw form as sand to the final product. The artisans will be blowing and shaping the glass using traditional methods. Enjoy a walking culinary tour of the city that was named a European Region of Gastronomy. The cobbled sweets and ancient buildings are a picturesque setting for tasting the smoked meats and country cheeses of the region. 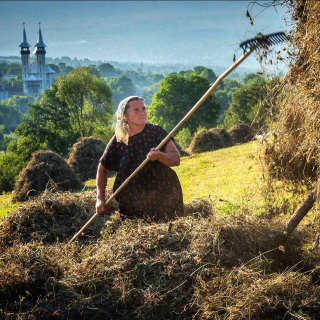 Photograph in the Open Air Village Museum, the biggest of its kind in Romania and see recreations of rural life from all regions in the country. Drive out into the countryside to photograph the landscape at sunset. During the morning, go to Biertan, a village where we find one of the seven Fortified Churches of Transylvania built by the German-Saxons, a UNESCO World Heritage site. We'll visit the Church, inside and out and enjoy the hilltop view of the area. Lunch at an organic farm and learn about ecological farming from the owners. Visit a coppersmith and visit his Roma family carrying on the traditions and crafts of the gypsy culture. Then, on to Sighisoara, one of Europe's best preserved medieval towns built in the 12th century where you have time to wander the streets photographing the colorful buildings. Wake in a charming village in time for a sunrise shoot as the villagers wander the streets pulling their small milk carts or taking the cows to pasture. The people of Viscri are striving to preserve the rural life and the original architecture of the German-Saxons. Many traditional occupations are seen here: bakers making homemade bread, brick makers and blacksmiths applying their trades. We will be able to visit and photograph the people at work. See the local Fortified Church, a UNESCO World Heritage Site and museum. ​Late afternoon, travel by course cart to a sheepfold on a nearby hill, visit the shepherds and discover how the milk the sheep and make cheese. Explore Bucharest in the late afternoon and discover Old Town, a vibrant place with historic buildings, cafes and small shops. You will be transferred from your hotel to the airport in Bucharest. Time for your flight home.